This CellML model runs in OpenCell to recreate the published results. The units have been checked and they are consistent. The model also runs in COR but due to the time being in minutes and the simulation time being 3000 minutes long the model is not ideal for running in COR. ABSTRACT: Studies in animals and humans suggest that the diurnal pattern in plasma melatonin levels is due to the hormone's rates of synthesis, circulatory infusion and clearance, circadian control of synthesis onset and offset, environmental lighting conditions, and error in the melatonin immunoassay. A two-dimensional linear differential equation model of the hormone is formulated and is used to analyze plasma melatonin levels in 18 normal healthy male subjects during a constant routine. Recently developed Bayesian statistical procedures are used to incorporate correctly the magnitude of the immunoassay error into the analysis. The estimated parameters [median (range)] were clearance half-life of 23.67 (14.79-59.93) min, synthesis onset time of 2206 (1940-0029), synthesis offset time of 0621 (0246-0817), and maximum N-acetyltransferase activity of 7.17(2.34-17.93) pmol x l(-1) x min(-1). All were in good agreement with values from previous reports. The difference between synthesis offset time and the phase of the core temperature minimum was 1 h 15 min (-4 h 38 min-2 h 43 min). The correlation between synthesis onset and the dim light melatonin onset was 0.93. Our model provides a more physiologically plausible estimate of the melatonin synthesis onset time than that given by the dim light melatonin onset and the first reliable means of estimating the phase of synthesis offset. Our analysis shows that the circadian and pharmacokinetics parameters of melatonin can be reliably estimated from a single model. Schematic diagram of the components and variables in a mathematical model of human melatonin. Diurnal rhythm of melatonin is observed in the plasma compartment. 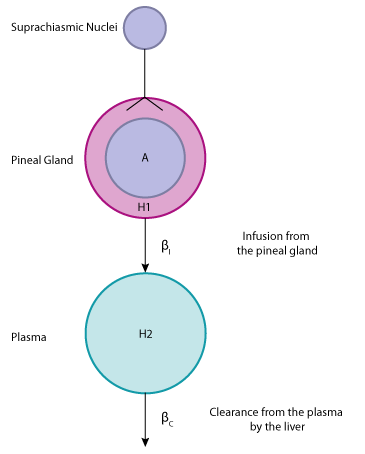 A represents N-acetylserotonin activity in the pineal gland, H1 is the concentration of melatonin in the pineal gland, beta_I is the plasma melatonin infusion rate, H2 is the plasma concentration of melatonin, and beta_C is the clearance rate of plasma melatonin. Derived from workspace Brown, Choe, Shanahan, Czeisler, 1997 at changeset 0a3138798f53.